A twisted path... as an idea/project has been developing. 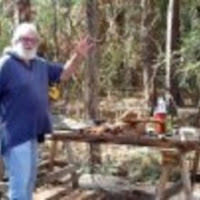 A few months ago, I got interested in a possible "Fairy House Festival" at a local arts center. They are on 55-acres of woods, wetlands, meadows... perfect for an array of small magical vignettes... I worked on the idea -- planning for a dozen or so artists to make these Houses and then have people over to visit and maybe make their own... and THUD. It seemed to loose a certain energy. A week passed. 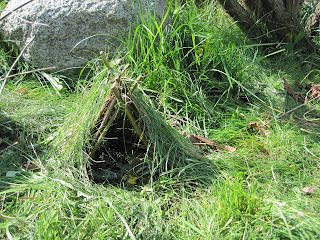 At a local garden center, I noticed a straw hanging basket, Hmm, flip it down and it's the start of a Fairy House. So I did. In my yard next to a Big Tree. Another Thud. energy gone... Another week. Looking at this "house" I began to understand some of my disappointment and loss of interest. It was all too human. It was just another, perhaps cute, way of making Nature Our Friend.. I remember seeing not only Fairy Houses, but all the furniture and accessories that go with it: the cute table, chairs, beds, acorn lamps with their moth wing shades! It was too narrative . 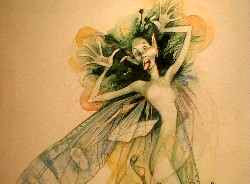 The storyline, based carefully on what hum,ans are like gutted the mystery from the energy the fairies represented. I realized that what I was missing was the danger, the feral quality of it. YIKES! Full-grown American men talking about Fairy Festivals and Hobbit Houses!! Who spiked the Viagra? What happens if we don't think of "HOUSES"
This school year, I worked with a fifth grade class in a school courtyard they were reclaiming. Together we biult a Hut in the corner from sticks we collected and pieces of bark for the covering. Is this just a big walk-in Fairy House? Altars have a extra meaning for me. My workbench is an altar; my desk is an altar. The shelf above my desk is an altar.There are many more. And yes, they are about the Dead, but they are mostly about weaving Memory and Longing into the present. Much of my artworks are altars. Oh, they just look like chairs, tables, shelves and carvings, but really they function as doorways to and from Elsewhere, to the thin places of imagination and memory. And like all doorways, things can pass both ways. I put them out there a fragile hopeful declarations of a brief existence and then I wait and learn from my objects and the people who use them. At a funeral, as we grieve the dead, aren’t the tears also for our own mortality, so bluntly confronting us? Budda is quoted as saying: Things are not as they seem, nor are they otherwise. by Frederick J. Waugh. 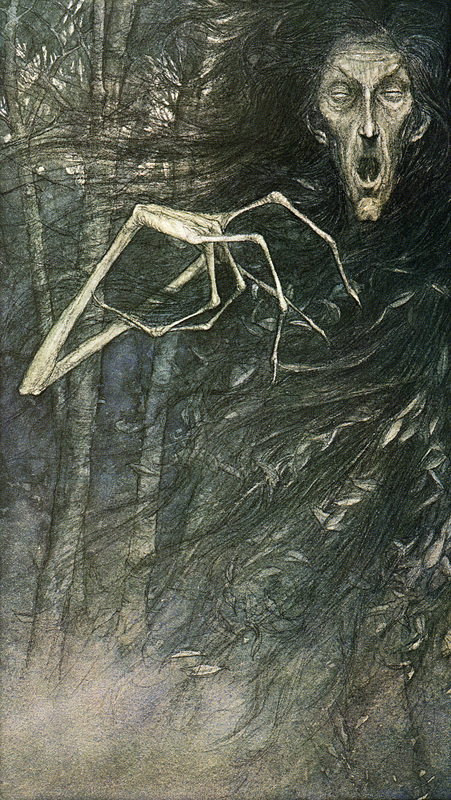 A tale of Tlingit and Haida Indians wherein a wizard from the north took eroded and rotted spruce stumps and created bizarre creatures called Munes, and this is their story. Illustrated with the most fabulous full page plates (8 color and 20 black and white) plus decorative initials and illustrations in-text. A very unusual book with very strange illustrations. The tree people in "Clan" were based on actual trees found in Cathedral Woods at the artists retreat on Monhegan Island, Maine. Waugh had hoped to write a book to rival Alice's Adventures in Wonderland but it did not sell well and the publishers eventually sold the remaining copies which were eventually destroyed.